← So Many Veggies, So Little Time! It’s As Easy As Pie! We’ve been serving up a lot of veggies in the recent weeks, so maybe we should treat you to a wonderful dessert. 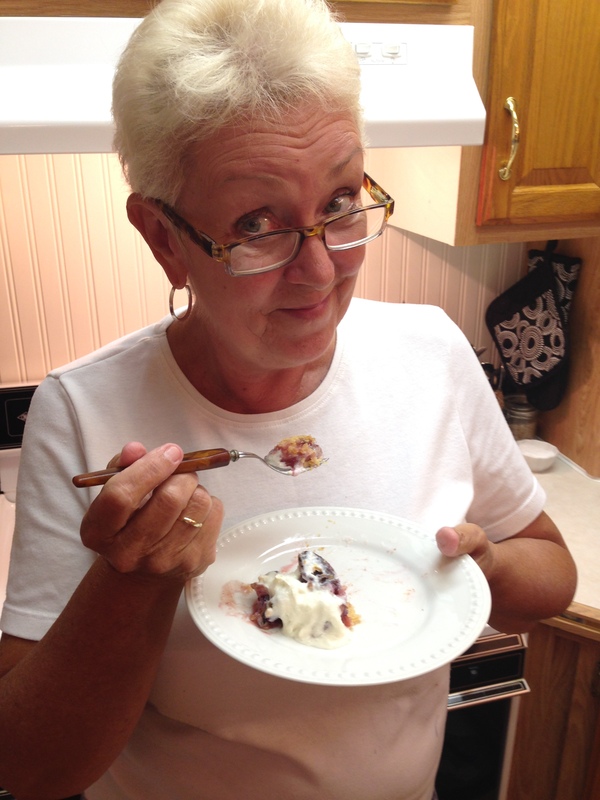 This post was written a week ago while we were still at the cottage but its not too late to give Plum Pie a try! It’s the time of year when Damson plums are in season so why not bake up a sweet juicy pie using them. The cinnamon in the pie makes the whole house smell welcoming! 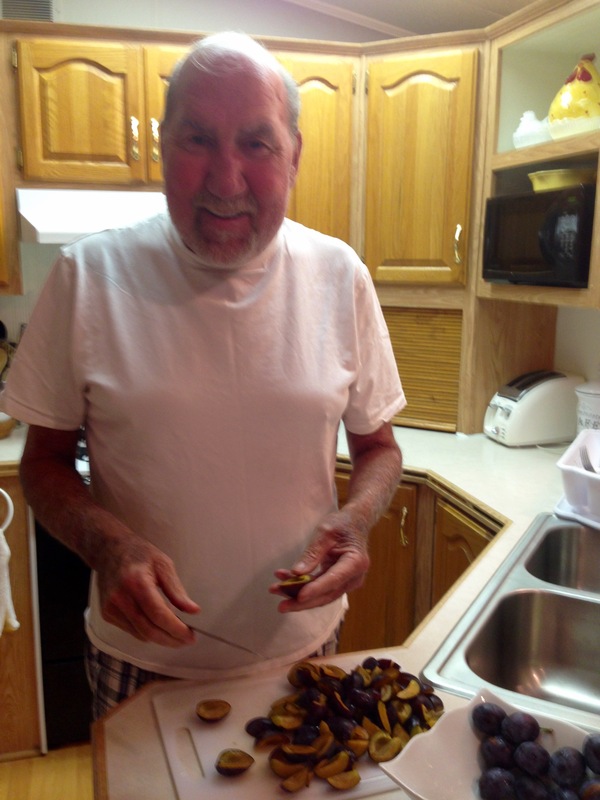 Since Harry’s the prep guy at our house, he had the job of pitting the plums and cutting them for the pie. 1 full pie crust and 1/2 a crust for the decorations. Cook’s Tip: Make clean-up really fast when rolling pastry. Wipe the counter top with a wet paper towel and then lay cling film over it in two slightly overlapping rows. I find two rows of cling film gives you enough surface areas to roll out a large pie crust. The water helps the cling film to stick to the counter and all the flour stays on top of the cling film. Once the pastry is rolled out, just gather up the cling film. There’s no flour stuck to your counter! Next line the pie plate with the pastry. 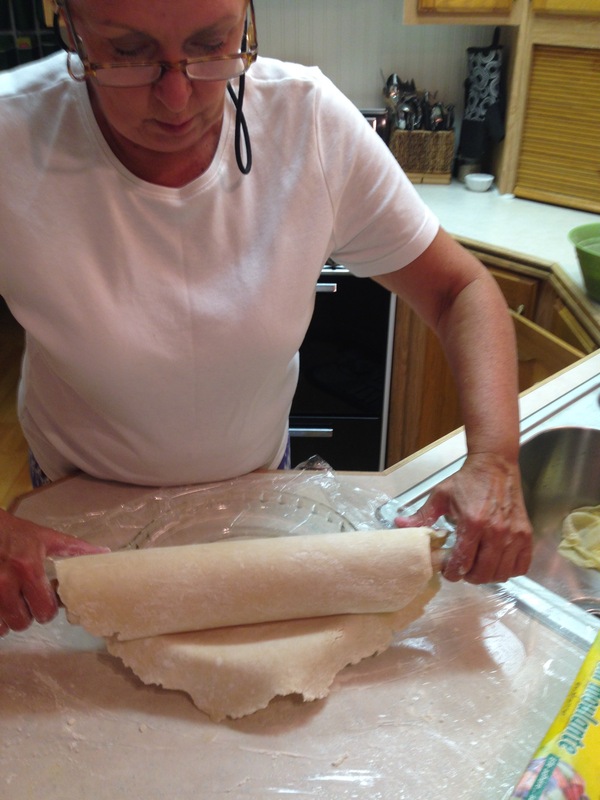 Notice I use the rolling pin to lift the pastry so it doesn’t tear. Let it roll over the pie plate. 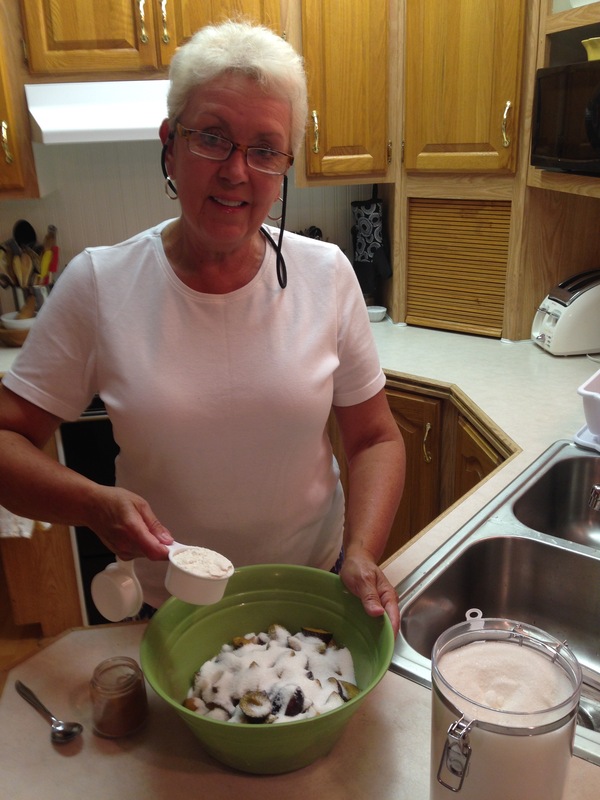 Place the plums in a large bowl and add the sugar, flour, and cinnamon. Stir well to cover the plums. Pour the filling into the pie shell and dot with the butter. Fold the pie crust so it covers the outer inch and a half of the filling. Brush with the beaten egg using a pastry brush. 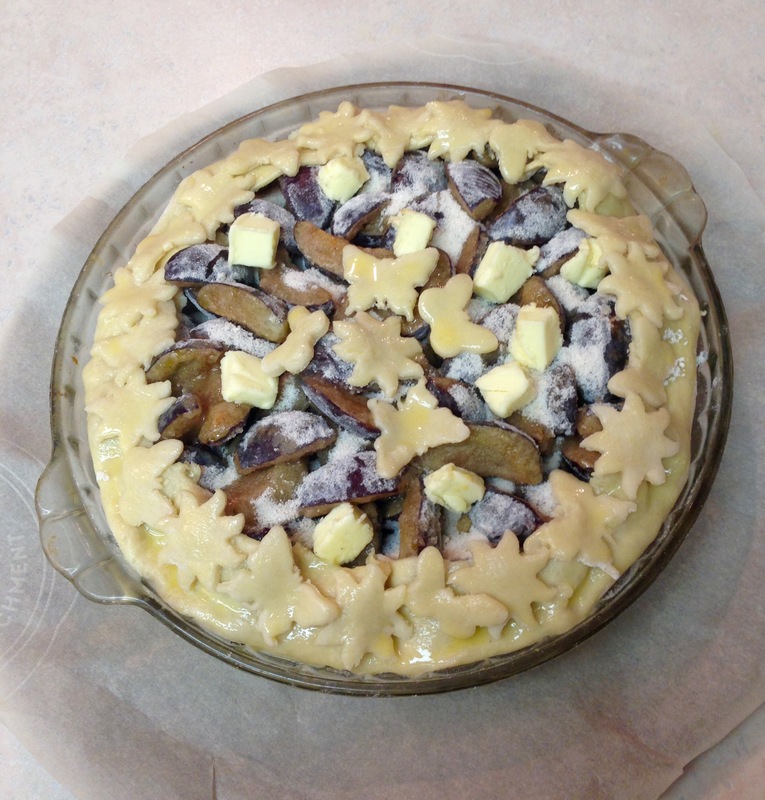 Decorate the pie by using cookie cutters to cut out pretty shapes from the pastry and add them to the edge. Brush the completed pie crust with a bit more egg wash and bake on the middle rack of the oven for 1 hour and 15 min but even up to 1 hour and 30 min at 375 F.
The finished pie is jewel-colored from the juicy plums. The crust is light and flaky. It’s time to get out the whipping cream and make some friends! Enjoy the TwoFoodNuts version of Plum Pie, we know we will. 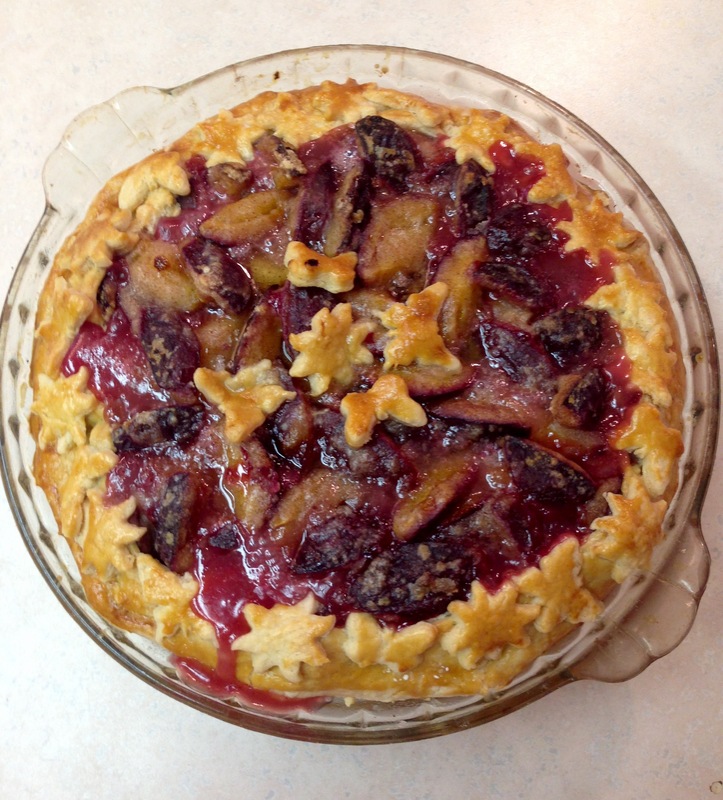 This entry was posted in Desserts, Fall, Fruit and tagged Damson Plum Pie, Damson plums, fruit pie, Plum Pie, TwoFoodNuts cooking. Bookmark the permalink.